How to get hold of healthy foods and products at a discount! I am passionate about reducing food waste and saving money and I’m really excited to have found out about this company that is selling healthy products which are past their best before date at a massively discounted price! I’m sure you guys know this already, but a best before date is a whole different thing to a use by date. If it says use by, then it means don’t eat it / use it after this date. If it says best before, it means that the product will be in it’s best condition before this date, but you can still use it past this date – just use your judgement. Usually shops get rid of items that are past their best before date, which is such a waste of all the resources that went into making them, a source of pollution in the landfill site and rubbish for the people who would quite happily use them up or even are in desparate need. Food bank use is on the rise in this country, which is terrible, so it’s really great that these products are being rescued, are affordable and are able to be put to good use. There are loads of food products on the website, which at the moment include things like organic extra virgin olive oil, currently priced at £3.80 instead of £9.89. I usually buy a similar olive in bulk from an organic wholesaler, but it still costs me around £7 ish a bottle, so this is a bargain! This wholemeal organic bread flour priced at 45p for a kg bag instead of £1.59 a bag is a steal and they also sell these thin rye crackers which I have fallen in love with after getting loads for free via Olio for 15p a packet instead of £1.15. The crackers are packaged in plastic and cardboard, but I wouldn’t be able to make them myself – there is some sort of magic involved in making rye crackers! Aside from food you can also buy health, beauty and baby products and if you like surprises you can sign up to a subscription where you pay a monthly fee and receive a box with all their ‘latest and greatest’ deals. Delivery is free if you spend over £50 so if you don’t want to lose out on the savings by spending on delivery charges and you don’t want a massive range of products you could buy staple products in bulk. I haven’t tried this site out yet, so can’t comment on their customer service, but it’s not easy to find discounted organic healthy products and this looks like a great way to get hold of them and help prevent food waste! 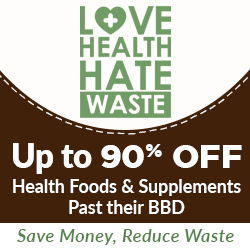 UPDATE: Love Health Hate Waste are offering my readers a discount of 5% if you click through from this site (either one of the links above or here: Love Health Hate Waste) and add the code thrifty17 at the checkout. This entry was tagged best before date, discounted food, eco, food waste, Frugal, Green, reduced, thrifty, use by date, zero waste. Bookmark the permalink. ← How to filter your water the plastic free-ish way!